Huge Power Raises the Pokémon's Attack stat. This Pokemon's Attack is doubled. 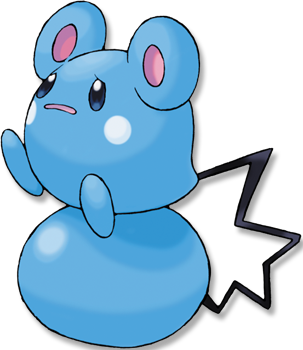 Ruby/Sapphire AZURILL�s tail is large and bouncy. It is packed full of the nutrients this POK�MON needs to grow. Leaf Green It battles by flinging around its tail, which is bigger than its body. The tail is a flotation device in water. Diamond/Pearl Its tail is filled with nutrients necessary for growth. It plays by bouncing on its tail. Platinum Its tail bounces like a rubber ball. It flings that tail around to fight opponents bigger than itself. Heart Gold Its tail is packed full of the nutrients it needs to grow. Soul Silver Its tail is packed full of the nutrients it needs to grow. Black Its tail bounces like a rubber ball. It flings that tail around to fight opponents bigger than itself. White Its tail bounces like a rubber ball. It flings that tail around to fight opponents bigger than itself.